Home › Faith › Ashamed of the Gospel? How often do we shy away from talk of spiritual materials either to avoid confrontation or to blend into polite social company? Religion can be such a divisive topic, or so we may rationalize to ourselves. But the apostle Paul sees otherwise. In the opening set-up in his letter to the Romans he presents his bold theme in verse 16 – that the gospel represents the full power and righteousness of God in offering the unmerited gift of salvation to all who believe. As it was first revealed to the Jews, now this salvation is also available to everyone including the Gentiles, i.e., all other people on earth. Good news indeed! Then why, outside of church or small Bible study group settings, do we mostly downplay it? Why are we ashamed to bring up this topic in some social circles? Why are we so unlike Paul, who apparently had no shame…or fear? There it is – Fear. We fear alienation or being ostracized by our friends, family and co-workers. I believe we also fear humiliation (or shame) in our inability to effectively articulate our beliefs, faith and socially intelligent justification for why we believe as we do. We do not want to appear foolish or out of the mainstream. So we water it down or avoid the discussion altogether. 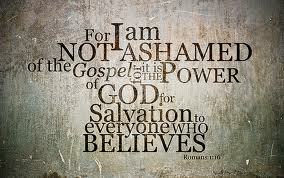 Unfortunately yes, many of us, unlike Paul, are ashamed of the gospel, or so it would appear. Our motivation therefore should be to mimic Paul, to study his teachings of the good news of Christ and the “new Way” that is Christianity as laid out in the New Testament. He outlines the beliefs well in this great Christian treatise (Book of Romans) sent to the early Christians in Rome (A.D. 56) as well as in his other letters or epistles throughout the New Testament. There should be no fear or shame in submitting ourselves to full surrender education by way of the Word of God and His empowering Holy Spirit. After all, it is a gift from God, the proclamation of the forgiveness of sins and our relationship with God restored through Christ. No shame in that.